…because you would have Chris Hansen on you so fast. With the NBA locking out its players just recently, here’s a sobering thought for anyone who’s a fan of both basketball and anime: Ro-Kyu-Bu! might be the only basketball on TV for the rest of the year. Who am I kidding — none of you guys are basketball fans! I kid, I kid… there’s always college basketball. 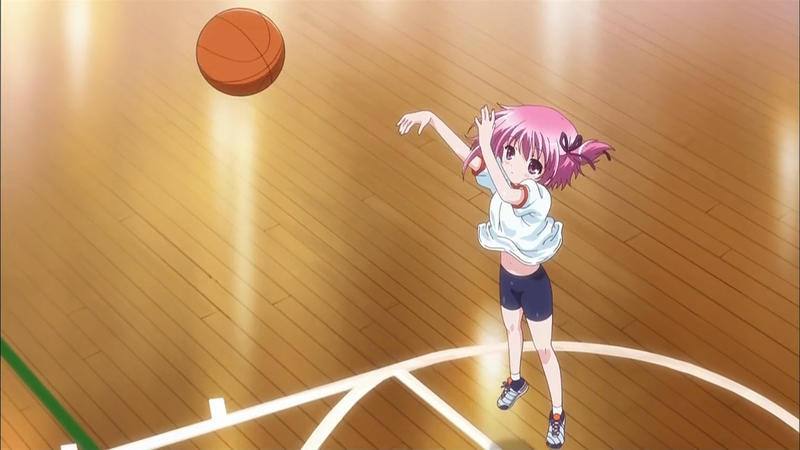 We open with a twig of an anime girl awkwardly trying to dribble a basketball literally wider than her torso. She’s being guarded by not one, not two, but three people at the same time. To top it off, there are only mere seconds left on the clock. Oooh, suspenseful. 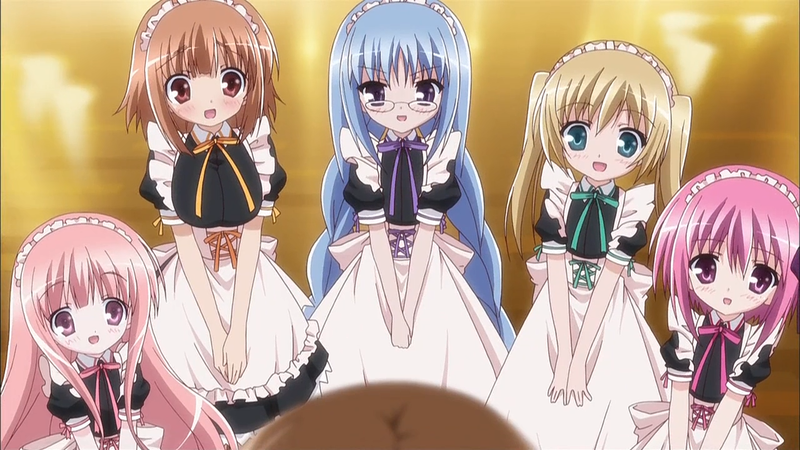 But once the OP comes and goes, any semblance of basketball flies out the window as the girls of the anime greet their new coach for the first day of practice in maid outfits. Our coach is Subaru, a high schooler with a totally tragic basketball past or something. It’s so serious that he’ll slam his eating utensils down when his mom(?) tries to make casual conversation with him about it. 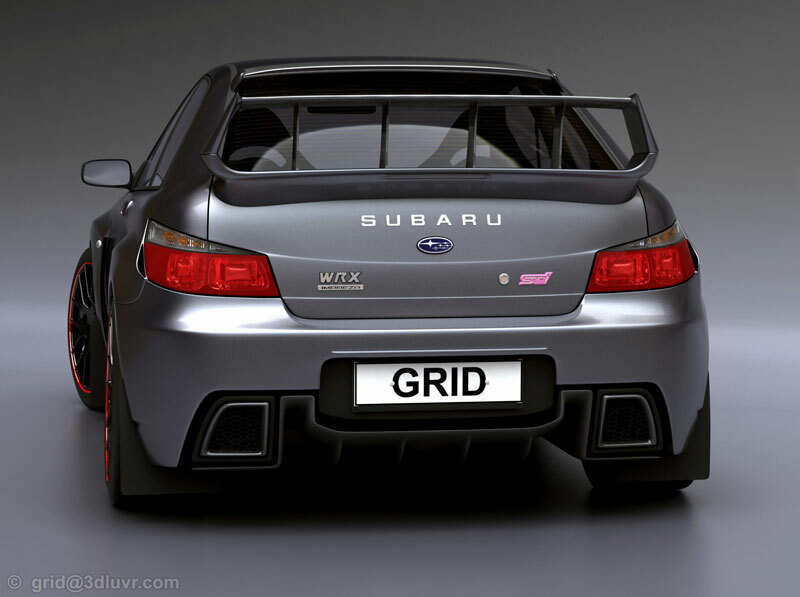 Silly Subaru — cars can’t play basketball. Nevertheless, he’s roped into coaching this misfit team of girls. There are only five of them, though. I guess they’ll just play the whole game without any substitutions. The girls are naturally inexperienced at basketball and have to run really basic basketball drills during practice. Except, however, for one special girl, the girl at the start of the episode — the one girl who dared to shoot… for her dreams! From the free throw line. This is, like, literally all that happens in this episode. There’s a pathetic moment when the tallest girl of the bunch breaks down and cry because she’s just too tall. In the land of the one inch princesses, the vaguely adult-looking female is apparently the freakshow. Right. Vroom vroom — run them over! 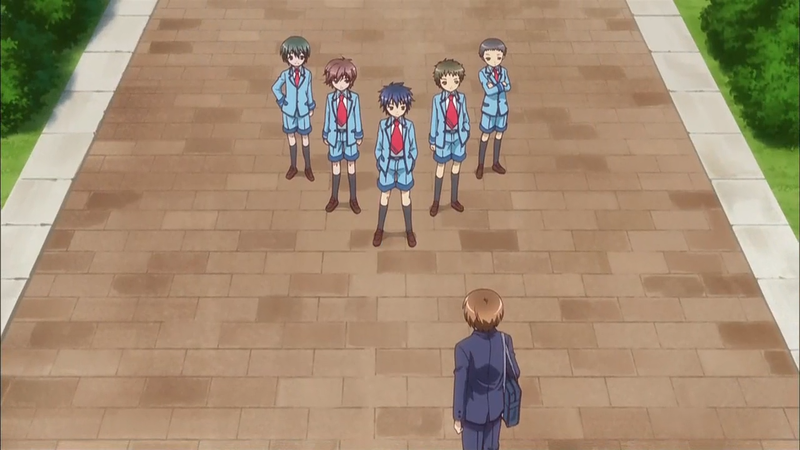 The episode finally ends with a band of killer shotas standing in Subaru’s path. At least I think they’re killer shotas — who can really tell with anime? But let’s get real — there are four or more of these anime every season. Just how much heart-warming do you need? Anime is caught in a feedback loop in which shows don’t just copy the trends of previous shows endlessly, but they must also needlessly one-up their predecessors. A show about cute high schoolers doing funny things? 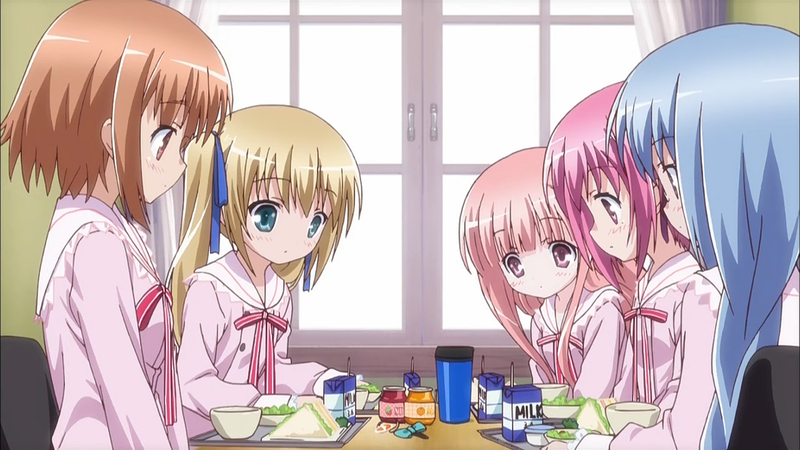 Here’s a show about cute grade schoolers doing even cuter things! Oh yeah? Here’s a show about cute grade schoolers playing basketball! Other shows have maids? These girls will dress up as maids too! Other shows have breast groping in the showers? So will we! We are trapped in a game of one-upmanship but instead of trying to outdo each other in awesomeness, anime tries to see just how big they can get the head mass to body mass ratio. Unfortunately, the average anime fan, i.e. most of us, won’t dare say anything overly negative or critical about anime like Ro-Kyu-Bu! In fact, they won’t say anything at all. They’ll resort to the worst possible course of action: silence. Nerd subcultures are too afraid to open themselves up to the standards of the rest of the world. The insularity of the anime subculture makes it so we must tolerate anything and everything or face ostracization from the rest of the fandom. You get the feeling that the anime production studios have realized the vast majority of their revenue comes from the hard-core otaku crowd, who just love this sort of material. They don’t reach out to other audiences very much… which means that those of us not into “moe” are disappointed by most of the anime churned out season after season. I once read that studios are given very little money to produce their shows from TV networks. I don’t know whether or not the situation has changed since then, but I can’t imagine that it has. With so little money at their disposal, I suspect that there’s just very little risk-taking involved. When the punters aren’t coming, pile them high and pile them cheap. On the contrary, this one seems to be “the” show to pick on this season. See recent posts by The Cart Driver (http://thecartdriver.com/blood-c-episode-1/) and Tenka Seiha (http://tenka.seiha.org/2011/07/ro-kyu-bu-01-fetishim-surprise/) for just the sort of criticism you’re looking for. Other people are pleasantly surprised, but even then it’s heavily qualified by an understanding of what they’re watching (http://kurogane.animeblogger.net/2011/07/02/ro-kyu-bu-01/). I did qualify my statement in saying that the average anime fan are unwilling to criticize in the anime community. A handful of bloggers are like flies in a strong wind; we hardly represent the hearts and m–… well, the hearts of countless anime fans posting on countless forums. 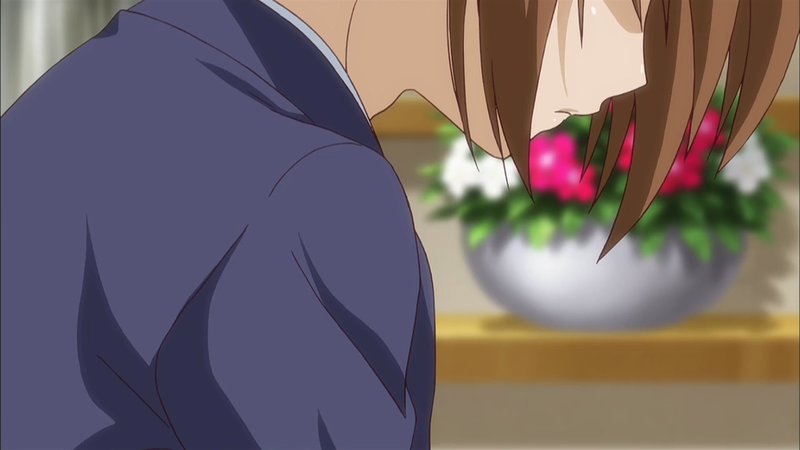 Plus, I suspect there are many blogs you didn’t name that would opt to ignore Ro-Kyu-Bu! in lieu of negativity. 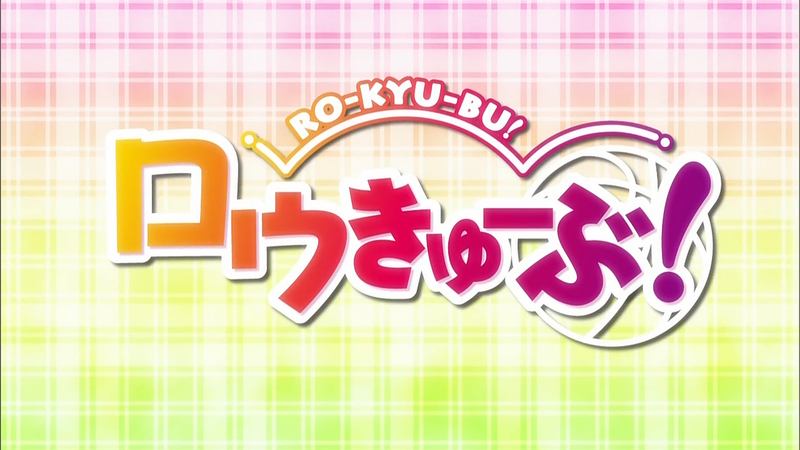 But even so, when I got to the ranting stage of the post, I was speaking generally of shows like Ro-Kyu-Bu! and its ilk. Maybe Ro-Kyu-Bu! 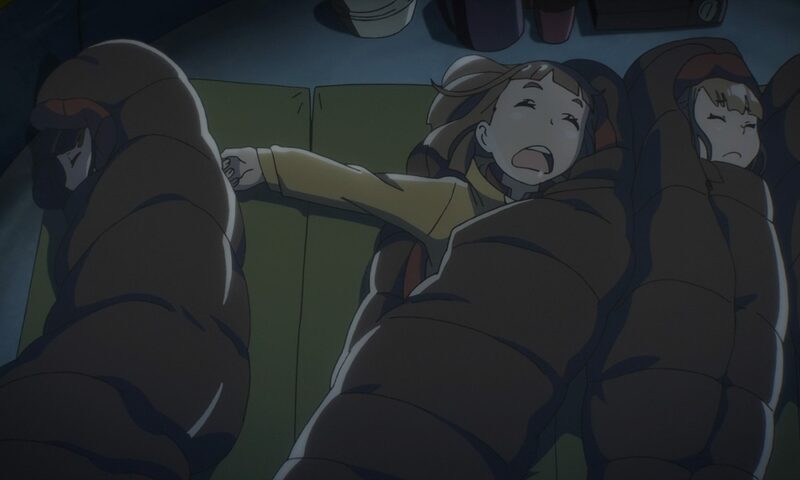 isn’t the darling of the anime community because it doesn’t have the weight behind it like other series I won’t bother to name, but I think the criticism still stands. Maybe there just wasn’t enough hate for it because it would have been unfounded. I won’t even ask if you got to episode 2 or 3 (as evidenced by kurogane). Also, dead thread is dead. I might see Slam Dunk instead. Seriously the characters are all the same. It’s another otaku buffet. Is there some sort of avatar machine where fans enter the anime to play it out through the male guy. Oh wait, that’s a dating sim. my mistake. This isn’t much different from a dating sim anyway other than the fact that any idea of romance is indefinitely deferred. Hey, did you know that basketball generally includes defense as well as offense? I mean wouldn’t it be crazy if players just left the path to the basket wide open for pretty much any half-hearted drive? The only reason they could play defense in college is because your best player was a guy like Tyler Hansbrough. Maybe not Hansbrough but the current team is huge on defense. Carolina was 1st in RPG for the tourney. Jon Henson was one of the top if not the top rebounders of the season. Besides I never said there had to be no offense like Harrison Barnes who will probably surpass Hansbrough if he stays all 4 years. You didn’t have to take my comment seriously and give me a scouting report of your team! I just don’t like the college style of play. The long shot clock, the multitude of zone schemes bogging down the opposing offense because few of the players have good enough handles to penetrate, or the college 3pt line encouraging bad teams to shoot the hell out of the long jump shot. Any post play is done by clumsy 6-7 short stacks. The NBA has a flow I’m simply accustomed to. Ugh. This show is proof anime is going downhill. I swear, if another one of these stupid shows gets made the season, i’ll stop watching anime permanetly.